Long-term, sustainable educational change requires political and social consensus when defining quality, equity and relevance. 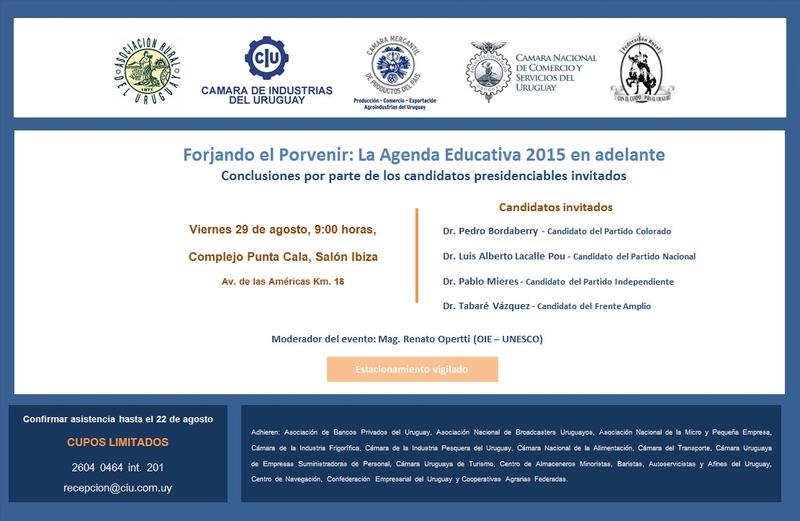 Earlier this year in May, representatives from leading trade associations in Uruguay united to discuss the country’s post-2015 education agenda. As a follow-up to that meeting, IBE Programme Specialist Renato Opertti will now moderate a discussion between the nation’s presidential candidates on the eight points of consensus reached at the May meeting, Aportes a un acuerdo político y social de largo aliento en propuestas y políticas educativas: 2015 en adelante (Contributions to a political and social agreement on long-term education proposals and policies: Post-2015). The goal of this meeting is to ensure that education is placed at the forefront of the political agenda during the upcoming elections this October. The organizers believe that continuing to provide forums for the government, private enterprise and the public to exchange perspectives on the post-2015 agenda is critical to developing a quality, equitable and relevant education for the country. In particular, the candidates will discuss the benefits of a common curriculum framework for basic and secondary education, assessment, the role of teachers, the transition between school and work, and the relationship between schools and other social sectors, among other topics. The roundtable discussion Forjando el Porvenir: La Agenda Educativa 2015 en adelante, Conclusiones por parte de los candidatos presidenciables invitados (Shaping the Future: The Education Agenda Post-2015, Conclusions by Invited Presidential Candidates) will take place on 29 August 2014 in Montevideo, Uruguay. The event is organized by the Asociación Rural del Uruguay (Rural Association), Cámara de Industrias del Uruguay (Uruguay Chamber of Industries), Cámara Mercantil de Productos del País (Mercantile Chamber of National Products), Cámara Nacional de Comercio y Servicios (Uruguay National Chamber of Commerce and Services) and the Federación Rural (Rural Federation). Representatives from several other trade industries have also been invited.